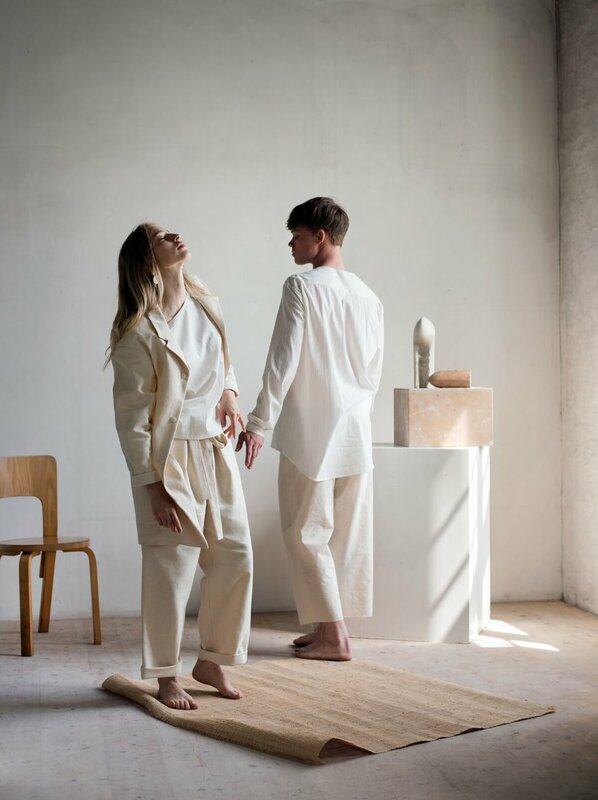 This weekend, during Copenhagen Fashion Week, object, interior and visual design studio Aure are about to extend their catalog with the launch of the all new clothing collection, Aure Garments. Aiming to create a timeless collection and outlast the circles of fashion, the unisex collection is characterised by its use of natural materials and textures, its airy and loose garments and the simple aesthetics that has become typical to the young agency. Part of the collection comes in the exclusive Aure Red colour — pieces of hand died garments made in collaboration with textile designers Sofie & Johanne Genz. These garments come in a very limited edition. We managed to steal a moment of their time during launch preparations to ask a few questions. Congrats on your new launch! For people who don't know, what is Aure? Aure is a Copenhagen-based design studio, made up of four individuals with shared passions and diverse skills. Moving from Oslo to Copenhagen sparked our ambition to start something together, that would show our common point of view. You started out with illustrations before moving on to clothes. That’s quite a gap. How does that work? The main motivation behind Aure is to work across disciplines with various creative expressions that all fit our aesthetics. Making the printed illustrations inspired the garment collection, which in turn has inspired us to start working on other projects. The aim is to, slowly but surely, create our own universe of visuals, objects and garments. A key word while designing Aure Garments has been versatility — wishing to create garments that can be worn by many, regardless of gender, size or age, and actively encouraging personal styling of the items. Since we work small-scale and produce locally in Denmark based on demand, we get the chance to interact quite closely with our customers. We can already see a diverse group of customers buying the clothing for everyday-use or as a part of their wedding attire. The launch is combined with Sindroms Magazine, will last for two days, and will be in the shape of a celebration and a pop-op store at VESS showroom. So if you feel inclined to indulge in fashion, art, magazines, dancing and a drink or two — treat yourself!